Documentarian/filmmaker Morgan Spurlock really seems to be having fun with the whole "meta" aspect of his new film The Greatest Movie Ever Sold, as he's extending it everywhere. 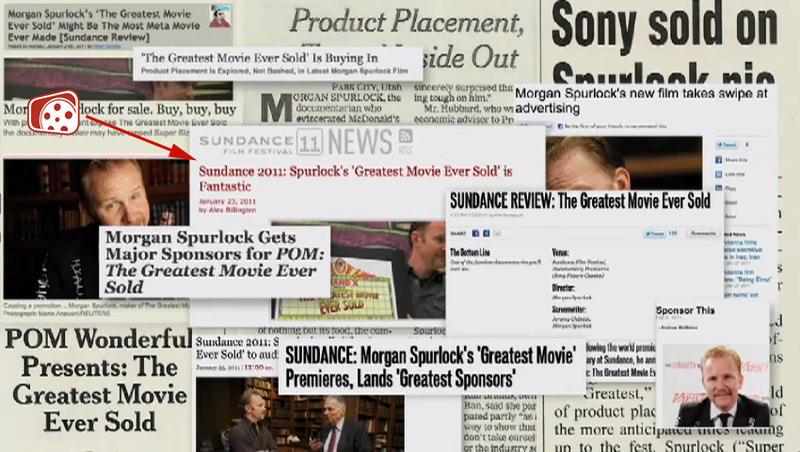 Spurlock hosted a 20 minute presentation at the recent TED 2011 event and titled it "The Greatest TED Talk Ever Sold", mostly because he actually sold the name rights online. Genius. Last week we featured Roger Ebert's fantastic TEDTalk, so today I'm featuring Spurlock's TEDTalk, as it's fun, brilliant, insightful and just entertaining to watch. Plus, FirstShowing.net has a cameo, as my review is shown on screen at the end (see it here!). Enjoy! "With humor and persistence, filmmaker Morgan Spurlock dives into the hidden but influential world of brand marketing, on his quest to make a completely sponsored film about sponsorship. (And yes, onstage naming rights for this talk were sponsored too. By whom and for how much? He'll tell you.)" I can't say it enough - I love TED! And I'm happy to feature some of their videos that finally seep into the film world, as they're almost always fantastic! This one was especially great to see and I can't tell you how excited I am to see The Greatest Movie Ever Sold again. We've got even more with Morgan Spurlock this week, stay tuned! Wow I saw this last week, boy is this site late. We just waited to feature it at a different day and time. We don't HAVE to follow the bandwagon and post everything the same time as everyone else. I'm sure there are plenty who haven't seen this yet! I haven't seen it yet, Alex. Am about to change that... ...thanks Alex. Saw it for the first time today. Great video. I love TED. sucked, turned it off after 12 or so minutes, I lasted that long. There are far better TED talks out there. For instance JJ Abrams "Mystery" talk, and more or less James Cameron's talk from last year, that is keeping them movie related.. as far as others, Anthony Robbins' talk is great and Ken Robinson's "Schools kill creativity" talk. You're right, there are far better TED Talks than this no question, but I liked it for seeing Morgan Spurlock take on this crowd and wrap it all up with this latest documentary, too. It was just a good show, not saying it's the best TED video I've seen or anything. And yes, saw both of and loved both of the Abrams and Cameron TED presentations you're talking about - both were great! Every single thing that Spurlock does just reinforces how much of an irritating, self promoting, faux-intellectual narcissist he is.